Unlike most people, I never had a problem with ironing. I actually find it therapeutic (well, you do know I'm a neat freak right? *laughs*) and used to help my mum with it when I was younger. Having used many types of iron before, I was actually shocked when I received the gigantic Philips PerfectCare Expert Pressurized Steam Generator (PSG) Iron as I have never seen anything like it before. Compared to the regular Philips iron that I was already using at home, the new iron was a lot smaller and lighter. The bulk of it is actually the Pressurized Steam Generator, which is able to provide continuous steam for up to 120g/min. Of course, that meant that you would require a stable base to put the relatively heavy base (do not place it on an ordinary ironing board!). In addition, all you need to do is lock the iron securely to the base and you would be able to carry the whole appliance easily! It's also really easy to get started. First, fill up the 1.5 litre detachable water tank with water, which can provide steam ironing for up to 2 hours without refilling (I filled it with only half of its full capacity and had more than enough left at the end of my ironing). Press the start button at the side of the base. It takes about 2 minutes for the appliance to start up before you're able to use it. The iron is really fast and powerful although the heat released is hotter than a regular iron. In addition, the Easy De-Calc, a hassle free & effective anti-scale system also ensures the durability of your steam generator. But no matter how impressive the iron is, to be honest, I was even more impressed with the Easy8 Ironing Board that came with it! 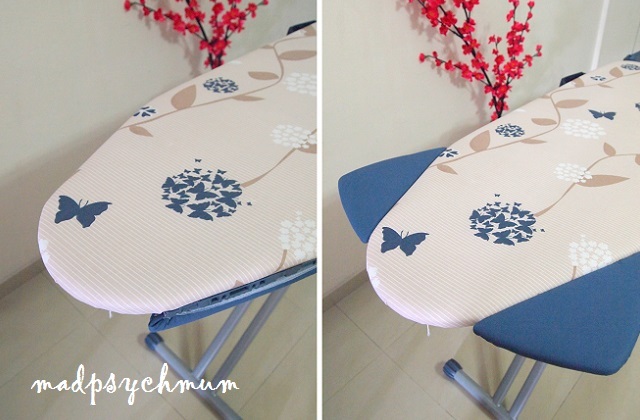 Compared to my regular ironing board, the Easy8 Ironing Board was definitely a lot bigger. And it has to be, in order to be able to support 5kg base plus iron! But that is not the reason why I found it so impressive. But more importantly, it has 2 easily extendable side boards which allows me to easily position the hubby's shirts with minimal adjustments. After you position the shirt, all you need to do is glide on the power iron and you're done in just 1 minute! For once, his shirts were easier to iron than my dresses! Even the mum-in-law was impressed. The best part is that this amazing ironing board (worth S$299) actually comes complimentary with the Philips PerfectCare PSG Iron, which retails at S$699 at leading electronics and departmental stores. It's quite expensive but there is always a price for quality! Disclosure: Complimentary Philips PerfectCare PSG Iron & Ironing Board were received from Philips Electronics Singapore for the purposes of this review. No monetary compensation was received; all opinions are my own.